Most of the world’s major car manufacturers now have operations in India and the automotive sector overall is a significant contributor to the country’s economy. However, the industry is having to prepare for the introduction of stricter emissions regulations, in line with the US and Europe, and to meet these higher standards all vehicles will in future need to be fitted with stainless steel exhaust systems. AMETEK SMP Eighty Four, one of the world’s primary producers of the speciality water atomized powders used to manufacture such systems, has been gearing up for this anticipated growth in demand by investing substantially in the country. Based in Pennsylvania, and part of the AMETEK Specialty Metal Products division, Eighty Four is a global leader in the design, development and production of both water atomized powders and roll bonded clad metal products. Water atomized powders are used in a variety of applications where corrosion, wear/abrasion, magnetic properties, permeability or high temperatures are a concern and Eighty Four produces structural powders typically used in a variety of solid-state compaction technologies including press & sinter, CIP (cold isostatic press), HIP (hot isostatic press) and roll compaction. Other powder metallurgical (P/M) technologies include MIM (metal injection molding) and MAM (metal additive manufacturing) where water atomized structural powders are used due to their morphology and physical properties. Good atmospheric and saline corrosion resistance, hot oxidation resistance and elevated temperature yield strength, at the most economical costs, are the key reasons for using 400 series stainless steel water atomized powders to make automotive components, including exhaust flanges and exhaust support brackets as well as rear-view mirror mounts, sensor rings, and seals. 409 is a ferritic, weldable grade of stainless steel offering high compressibility, enhanced green strength and good sinterability while 434 is a low carbon stainless steel used in mildly corrosive environments. The 300 Series powders are austenitic stainless steels typically used for powdered metallurgy (P/M) press and sinter applications to make near net shape parts for a variety of applications. 304L is a corrosion resistant material that exhibits good property stability below 1000 degrees F, making it a good choice for parts that will not be subjected to demanding machining operations. 316L offers the highest degree of corrosion protection available in standard stainless steel grades providing very good strength at extremely high temperatures. The great advantage of press and sinter applications for the automotive industry, typically a replacement technology for stamping or machining, is the reduction in material costs. Because the process enables working to net shape, there is little of the scrap material associated with more traditional methods. 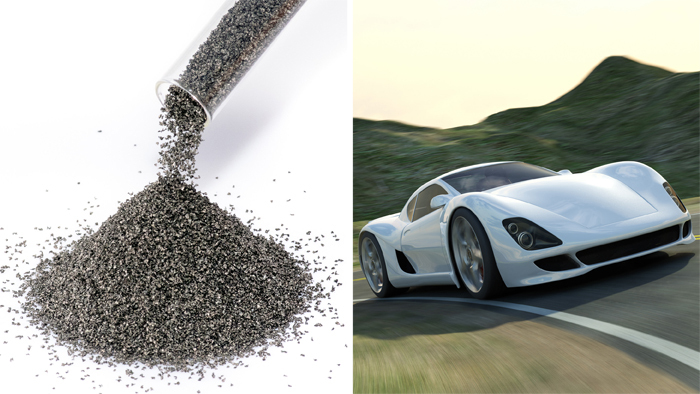 In addition to serving the world’s automotive industry, Eighty Four is a preferred supplier for stainless steel and high nickel alloy products for use in a number of other sectors, including traditional and alternate energy markets where water atomized powders in the form of NiAl and NiCr support fuel cell applications and hardfacing alloys such as PF 50 and PF 60 are used as wear coatings. For the oil & gas industry, specialty powders are used to produce hardfacing alloys which can be blended with Tungsten Carbide (WC) to produce effective wear coatings for downhole equipment.